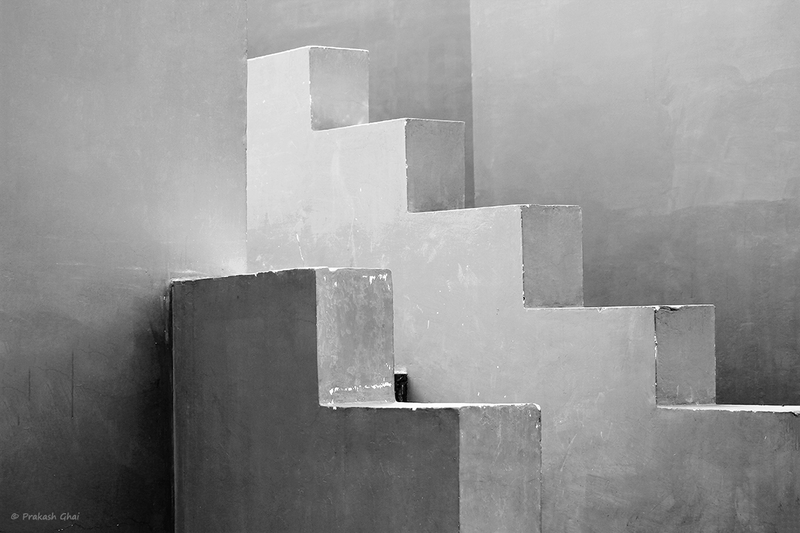 I have titled this as Synchronized Geometry because, these Zig Zag walls that you see are not merely walls, they are in fact concrete side railings of an actual staircase located at Jawahar Kala Kendra, Jaipur. Generally, such railings are like flat diagonal lines but this Zig Zag pattern is created by the differential placement of stone slabs. The photo falls under the Minimalism Category: Minimalism as Simple Geometry. Simple geometry is quite evident here. I have clicked the photo from the side to show contrast between two similar patterns or Zigzags. The bigger or the longer side rail has more repetitions, whereas the smaller or the nearer one has less. Another reason I shot this from the side was to show a bit of depth in the frame and to keep the angle unique.